Long live the pumpking! Maybe next year I’ll do an all-gourd edition. Regular readers may have noticed that I have a deep, abiding love for both puns and Halloween. Celebrating the combination of the two is becoming an annual tradition around here; see Top 10 Punny Halloween Costumes and 10 More Punny Halloween Costumes if you missed them the first time around (and especially if you need a last-minute costume idea). But you know what I like better than puns or Halloween costumes? Animals. And you know what I like better than animals? Animals in punny Halloween costumes, of course. Why, they’re pawsitively purrfect! If you’re a pun/Halloween/animal lover like me, these costumes will leave you ast-hound-ed and a-mew-sed. Always calls a foul for unnecessary ruffness. I think Paul Mewman won an Oscar for this one. Pairs nicely with a pugkin spice latte, obvi. You better watch out … because Santa Claws will scratch your face off for making him wear this humiliating costume. That’s a mutt-load of dog puns! Your wish is her command. Because she’s a dog, and that’s the deal they make with humans. He spends the last two books looking for Lord Voldemort’s Horse-cruxes. She came in like a rrrrrrrecking ball. Or maybe it’s a rab-bee-t? Slow and steady wins the punny Halloween costume countdown. This entry was posted in Holidays, Puns and tagged animal halloween costumes, baked pugtato, bunny bee, corn dog, halloween costume ideas, halloween costume puns, halloween costumes, halloween costumes for pets, harry trotter, hot dog, i dream of weenie, muttley cyrus, pool shark, punny costumes, puns, rufferee, santa claws, sheep dog, slow cooker, watch dog on 26.10.2015 by Laurel Shane. It’s that time of year again. The leaves are turning, the air is nipping, and food is being pumpkin spiced. 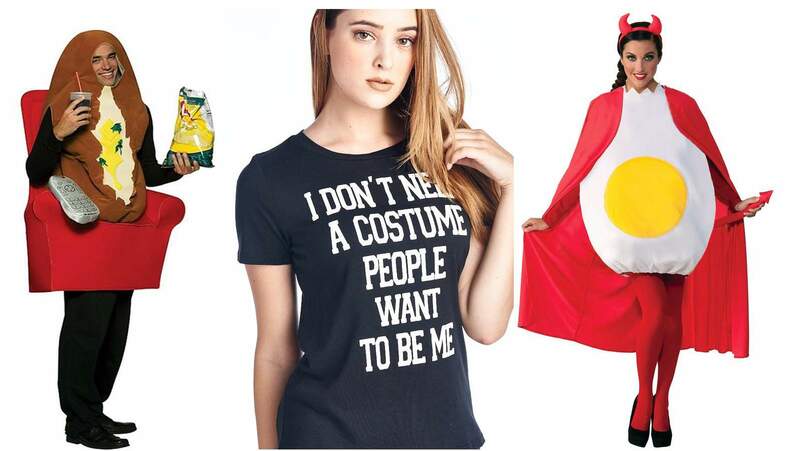 But most importantly, people are creating their pun-based Halloween costumes. Last year I celebrated the season with the Top 10 Punny Halloween Costumes. This year I found ten more punderful costumes that you can use to show how clever/broke/last-minute you are. Enjoy! The defendants are being charged with felony wordplay. Not to get nitpicky, but I think this is slightly larger than cap-sized. Still, good work with the cardboard. She’s homicidal for Cocoa Puffs. Who knew the Grim Reaper was so concerned with oral hygiene? She has the magical power of reading. Hi, my name is (what) my name is (who) my name is (chicka-chicka) Slim Bag-Lady. This one’s for all the literalists out there. America runs, dribbles, jumps, shoots, and scores on Dunkin’. This suit doesn’t fly, but it does eliminate wrinkles. Your move, Tony Stark. I’ve set my lasers from stun to swill. This entry was posted in Holidays, Puns and tagged a brush with death, a formal apology, a-salt and battery, bag of eminems, bud light-year, cap-sized ship, cereal killer, dunkin' donuts, god's gift to women, halloween costume ideas, halloween costume puns, halloween costumes, iron man, punny costumes on 04.10.2014 by Laurel Shane. Okay, it’s not really a costume, but hey: steam punkin! The best defense is a good Gandalf. The writers on New Girl clearly love a good pun. Not pictured: Bee Arthur. This is possibly the only costume a cat would be proud to wear. She still looks a little embarrassed, though. Combining three of LJBC’s favorite things: spelling, puns, and cuteness. Still scrambling to put something together? This is probably the easiest last-minute costume on this list. Feeling sad about the end of Breaking Bad? This will cheer you up. Rock ‘n’ rolling all night fills them with such ennui, no? Cutest costume ever. This seriously makes me want to take up crochet. And reptile ownership. Samuel Johnson famously claimed that puns were the lowest form of humor, but I think this post proves that a good pun is its own reword. Happy Halloween, everyone! This entry was posted in Holidays, Puns and tagged halloween costume ideas, halloween costume puns, halloween costumes, punny costumes, puns on 31.10.2013 by Laurel Shane.